EasyBook is a Property Management System (PMS) for accommodation businesses. EasyBook is used by Hotels, Motels, Guest Houses, B&Bs, Inns, Lodges, Campsites, Caravan Parks and Self Catering Apartment businesses of all types and sizes across the world. 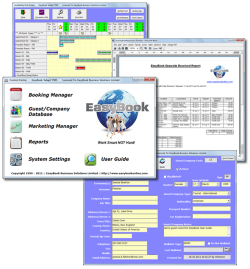 EasyBook has been one of the market leaders for Hotel & Motel Software in the hospitality and tourism industry since 1999. EasyBook runs on Microsoft Windows 10, Windows 8 or 8.1, Windows 7, Windows Vista and Windows XP. EasyBook can be run on Apple Mac Desktop and Laptop computers using BootCamp, VMWare Fusion or Parallels (see our Commonly Asked Questions page for more information about doing this). You can read what customers have to say about EasyBook on the Customer Reviews page. The EasyBook "Adapt" Property Management System (PMS) assists you in running all aspects of your accommodation business (front/reception desk, bar/restaurant, marketing and back office/accounting). EasyBook helps you to manage important booking and guest information and related activities. Over the years we have worked closely with customers to add many new features and improvements to EasyBook, this is something we constantly look to do. We offer a FREE 30 DAY TRIAL with no obligations so you can take a look at what this great piece of software can do for your business. Download Your Free Trial NowTry out the EasyBook system free of charge for 30 days! We believe that a great product deserves great customer service to back it up. This is why we run a helpful, professional and knowledgeable EasyBook Help & Support Service (inc. Free Updates) to give you assistance when you need it, as well as peace of mind. We understand that businesses providing accommodation rely heavily on the software and systems they operate, so we do everything we can to help keep your business running smoothly. See this page for a list of all our EasyBook Products & Services. See this page for Latest News and Articles about EasyBook and EasyBook Business Solutions Limited. See this page for more information about the History of EasyBook and EasyBook Business Solutions Limited. We offer special pricing for registered charities and "not for profit" organisations. If you own or run an accommodation centre or shelter and are looking for a booking system to help manage your resources, please see our information page for Charity, Voluntary and Community (Non-Profit) Organisations. If you are an existing EasyBook customer, consultant, or supplier to the hospitality/tourism trade and would like to be rewarded for recommending EasyBook products and services, take a look at our Agent and Reseller opportunities. a) To build Affordable, Reliable & Easy to Use Property Management Systems for Hotels, Motels, Guest Houses and B&Bs. b) To provide high quality Help & Support Services to give our customers peace of mind. "We write as owners of the White House Motel in Mohawk, situated on the edge of Lake Superior in the USA. We were looking for ages for a reasonably priced motel booking system for our 10 bedroomed Motel. We stumbled upon the EasyBook solution, the service we received from day one was exceptional, the system after a little practice was so easy to use and set-up. Most other systems were quite complicated. Our investment in the EasyBook system was well worth it and we are already recommending the system to other Hotel/Motels in our area. Download the trial version and see for yourself... Regards, Bob and Cheri Hughes (well satisfied users)." Copyright © 1999 to 2019 All Rights Reserved by EasyBook Business Solutions Ltd.